Note: At this time, all dates subject to minor adjustments. See the full itinerary below. shamans' donations for group work and additional translators and transportation. For single occupancy, there is an additional cost of $830. *Does not include air, to and from Moscow, visa or traveler's insurance and is based on group capacity. $1,000 deposit will hold your space; remainder is due May 13, 2007. This is the preliminary booking, but we must be flexible with domestic travel due to weather, equipment and other unavoidable occurences. Traveling in Russia is not difficult and all arrangements will be made for us, but we must travel with patience, compassion and a sense of humor. Keep in mind that this itinerary could change slightly for many different reasons. * Excursion to the Moscow Kremlin & Kremlin Cathedrals + Armory Chamber. The Kremlin has always been perceived as a symbol of power & might of the Russian land. Each era of Russian history left it's architectural mark on the Kremlin. Within the Kremlin walls there are many architectural monuments, churches, cathedrals, museums, etc. * Tour to the Tretyakov State Gallery. The Tretyakov State Gallery - one of the world's largest museums, a treasure house of old Russian art from the 11th cent. till our days. The gallery bears the name of its founder, Pavel Tretyakov, a rich Russian manufacturer and patron of art. He presented his collection to the city of Moscow in 1892. Now the Tretyakov Gallery holds more than 50,000 works of painting, graphic art and sculpture. Transfer to airport; Flight from Moscow to Irkutsk. We will stay on beautiful Ohlkon Island, sacred land of the Buryats. Here we will participate in a gathering of Buryat shamans from Buryatia, Mongolia and China who meet at this place each year in July. There is time for ceremonies, learning about ancient shamanic traditions of the Buryats and exploring the island. Hiking, swimming and boating are some of the options available to us. We will stay at Nikita's Homestead for tourists and all meals are included while on the island. We will return to Irkutsk to explore the city and southern part of Lake Baikal. Dinner and lunch provided. During these days, we will be with Ai-Churek (Moon Heart) Oyun, shaman and manager of the Shamanic Clinic in Kyzyl. 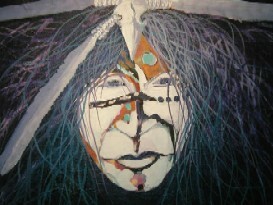 She will be leading us to sacred places in the area for ceremonies and workshops. We will have time to work with the other shamans at the clinic as well and to have private sessions as you wish. Kyzyl is a small city of about 100,000 people. It is easy to walk to the nearby park, shopping, markets and restaurants. Some Lunches and/or Dinners depending on our schedules with the shamans. Leave for home or other parts. $1,000 deposit is required to hold your place; the remainder to be paid by May 13, 2007. Please call or email me if you are interested in participating on this journey. $1,000 deposit will hold your space; remainder is due June 10, 2007. Transfer to airport; Flight from Moscow to Tuva. During these days, we will be with Ai-Churek (Moon Heart) Oyun, shaman and manager of the Shamanic Clinic in Kyzyl. She will be leading us to sacred places in the area for ceremonies and workshops. We will have time to work with the other shamans at the clinic as well and to have private sessions as you wish. Kyzyl is a small city of about 100,000 people. It is easy to walk to the nearby park, shopping, markets and restaurants. This is the time of national holidays or Naadam and we will enjoy the local festivities including wrestling, horse racing, visits to the yurt camp and throatsinging. Some lunches and/or dinners depending on our schedules with the shamans. Full day excursion to Lake Baikal and visit to Listvyanka village and the Wooden Village Museum. Cruise on lake with picnic. Return to Irkutsk. Transfer to Train Station; overnight train to Ulan Ude arrives early morning. Here we will work with the Buryat shamans at the shamanic clinic and other sites. We will also visit local cultural sites of the Old Believers' Village, the Outdoor Museum, the Ethonographic Museum and a Buddist monastery (datsan) outside the city. Dinner and lunch with Old Believers' tour. Transfer to hotel. Free time. $1,000 deposit is required to hold your place; the remainder to be paid by June 10, 2007. Ulaan Baatar, Middle Gobi, South Gobi and Eagle Valley, Gobi Museum, Gobie Gurvan Saikhon National Park, Largest Sand Dune Khongor, Dinosaur country, Ongi Temple, Flaming Cliffs, Bayanzag, Erdenezuu Monastery, Orkhon Watefall, Torkhon Monastery, Ugiil Lake, Khugnis Khan National Park, Ulaan Baatar. I will be glad to arrange a group tour of Mongolia to be held between the two Siberian journeys. Should you wish to join this extended tour, please let me know immediately. Final arrrangements are pending. Minimum 6 participants. For Journey 1 travelers: Includes travel from Irkutsk to Ulaan Baatar and return to Moscow. For Journey 2 travelers: Includes travel from Moscow to Ulaan Baatar and meets Journey 2 in Tuva.